DeMar DeRozan is an outlier among NBA shooting guards, in that he can’t shoot. The Raptors wing is a career .282 three-point shooter, which is lower than DeMarcus Cousins’s career mark, and he’s shooting even worse this year. Dwyane Wade had a distinguished career without being able to stretch the floor, but he’s an outlier. With the NBA speeding up and spreading out, shooting has never been more foundational to NBA offenses (the league has set new marks for three-pointers per game in each of the past six seasons), yet DeMar DeRozan is a near superstar, and he’s having one of the best seasons in the NBA thus far. 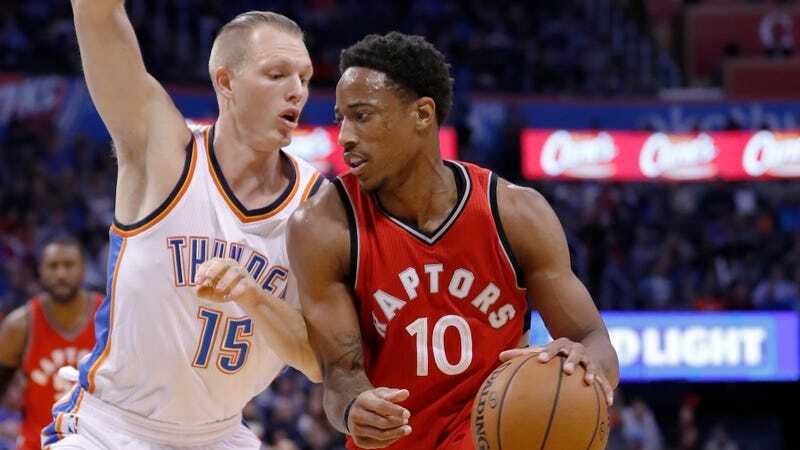 Tonight, DeRozan put up 37 points on 22 shots in a win over the Thunder. That sort of efficiency for a guard is usually dependent on hitting both three pointers and free throws, but DeRozan only took two threes and he missed them both. He’s as good as anyone in the league at drawing fouls, which is boring, but he can also get up and dunk on people’s heads. DeRozan is averaging 34.1 points per game (the best in the NBA) and he’s one of only three players in the past 35 years to start a season off with six 30+ point games in his team’s first seven games. Here’s a highlight reel. It’s still incredibly early in the season, but the Raptors have made the fewest threes of any NBA team and they’re shooting the league’s worst percentage. That sounds like a recipe for a stagnant mess of an offense, and yet they’re in the top-ten in offensive efficiency. A great deal of that is because DeRozan is shooting out of his mind from inside the arc and getting to the free throw line more than ever. That’ll probably level out at some point, just like the rest of Toronto’s guards will eventually remember how to shoot, and the Raptors are probably going to end up as one of the league’s best ten or so offenses. They have the great misfortune of playing in the same conference as LeBron James, so even when Jonas Valanciunas comes back, their ceiling is still most likely two-seed, but at least they know exactly how good DeMar DeRozan is.